Front & Rear Rotor to Hub Bolt & Nut Kit. Thread pitch is 3/8" X 16 X 1". Available in the stock version with the thin hex head - pictured (Thin wall socket required), or in the custom rounded button Allen head type. 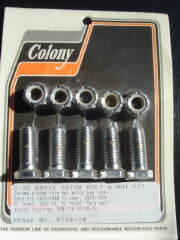 Replaces OEM # 41198-73. Select the needed application from the option menu below. Colony Stock # 8738-10 and 8739-10.